The 1930s was an incredibly rich decade for the violin concerto, thriving on what was the uncertainty of the age. Over 30 violin concertos materialized across the decade with well over a dozen, from Stravinskyand Berg’s through to Barber’s and Britten’s concertos all commanding iconic status within the violinist’s repertory. Gil Shaham is the leading violinist of his generation. He was awarded an Avery Fisher Career Grant in 1990, and in 2008 he received the coveted Avery Fisher Prize. In 2012, Gil was named “Instrumentalist of the Year” by Musical America, citing his “special kind of humanism”. Combine this “humanism” with a flawless technique and his generosity of spirit, and the musical results are nothing short of inspired. CD1. 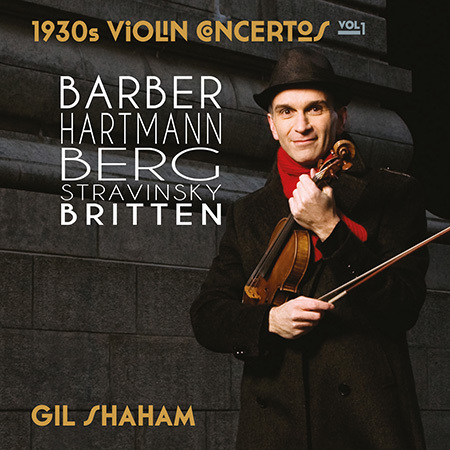 Gil’s recording of the Barber Violin Concerto displays his trademark rich soulfulness as well as the sounds of urban America when called for, skyscrapers, sirens, clearly manifest themselves in the last movement. The weeping, if not lamenting, solo violin in the Berg concerto, harmonized with very poignant 12-tone chords, reveals emotionally charged heart on sleeve mourning in this recording. For Hartmann’s Concerto funebre Gil is reunited with acclaimed Sejong Soloists, with whom he has recorded Mendelssohn’s octet and Haydn concerti (CC08), the New York Times observing from a concert performance of the Hartmann that Shaham “perfectly characterised the work’s anguished and occasionally angry spirit”. The second disk successfully combines gritty dissonance with long-breathed lyricism. Shaham performs all these with a natural flair and innate authority that is hard to ignore. Shaham’s rendition of the Barber concerto showcases his trademark rich soulfulness, as well as energy in the bustling sounds of urban America in the last movement. The lamenting lines of Berg’s concerto cut to the emotional core. The second album includes scintillating account of Stravinsky’s concerto and incisive playing in Britten’s concerto. An auspicious beginning. Gil Shaham's survey of violin concertos from the 1930s pairs the familiar with the fringe … Hartmann’s, fabulously delivered by Shaham and a Korean ensemble, is a near-masterpiece by an undervalued composer… Shaham performs with top orchestras – New York Philharmonic, Dresden Staatskapelle, Boston Symphony and BBC – and in excellent sound. His series promises to be an essential adjunct to our understanding of the era. It took an artist’s intuition to register that most of the best modern concertos were composed in the 1930s, the darkest of decades. Hitler was rampant in central Europe, Stalin was murdering millions, Spain was riven by civil war and the world’s economy was in the dumps. Gil’s first volume is my Album of the Week on sinfini.com. His recording of the Hartmann and Barber concertos are pretty much without equal.